This article is about the passenger train. For the Cormac McCarthy play, see The Sunset Limited. For the film based on the play, see The Sunset Limited (film). The Sunset Limited eastbound in 2004. The Sunset Limited is an Amtrak passenger train that for most of its history has run between New Orleans and Los Angeles, over the nation's second transcontinental route. However, up until Hurricane Katrina in 2005, it ran between Orlando and Los Angeles. It is the oldest named train in the United States; it was first introduced in 1894 by the Southern Pacific Railroad, and was handed to Amtrak upon its formation in 1971. This train is one of only two of Amtrak's 15 long-distance services which run only three days a week (the other being the Cardinal). Consequently, the Sunset Limited carried the fewest passengers of any Amtrak train in fiscal year 2016, 98,079, a 2.6% decrease over FY2015. It had a total revenue of $10,769,179, giving it a 7.5% decrease over FY2015. 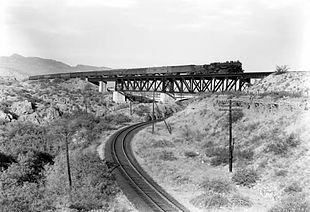 For most of its existence, the Sunset Limited route was owned by the Southern Pacific Railroad. The name Sunset Limited traces its origins to the Galveston, Harrisburg and San Antonio Railway, a Southern Pacific subsidiary which was known as the Sunset Route as early as 1874. Most of the current route from New Orleans westward is now owned by the Union Pacific Railroad, which acquired Southern Pacific in 1996. However, most of the route within Louisiana itself was sold to BNSF Railway in 1995 in return for BNSF not objecting to the UP-SP merger. On the portion of the route east of New Orleans, service was suspended after Hurricane Katrina. Those tracks, between New Orleans and Florida, include parts of the Atlantic Coast Line Railroad, the Seaboard Air Line Railroad, and the Louisville and Nashville Railroad—all now owned by CSX Transportation. Currently, the segment of the former Atlantic Coast Line Railroad between DeLand and Orlando is owned by Orlando's commuter service SunRail. Service on the Sunset Limited between New Orleans and Florida has been suspended since August 29, 2005 because the rail line in the path of Hurricane Katrina east of New Orleans was washed out. The operating railroad CSX restored the line itself between New Orleans and Jacksonville. However, in 2006, Amtrak said it was deemed too expensive to rebuild to modern passenger rail standards. In 2016 Amtrak proposed to return the Sunset Limited service to Florida in the near future. Eastbound trains leave Los Angeles on Sunday, Wednesday and Friday. Westbound trains leave New Orleans on Monday, Wednesday and Saturday. The journey takes two days to complete in each direction. At San Antonio, thru-cars from the Texas Eagle are combined with the Sunset Limited for the journey westward and split eastward. When combined with the Sunset Limited, the Texas Eagle is numbered as 421 westbound and 422 eastbound. A highlight of the trip is the crossing of the Huey P. Long Bridge just west of New Orleans. The bridge is one of the longest railroad bridges in the United States, at 4.5 miles (7.2 km); it takes the train 135 feet (41 m) above the Mississippi River. In its present form, the eastbound Sunset Limited leaves Los Angeles in the middle of the night, traveling overnight through Arizona before arriving at breakfast time in Tucson and mid-afternoon in El Paso. After traveling through west Texas overnight, it separates from the Texas Eagle in San Antonio. Resuming the second day of the trip, it arrives in Houston at lunchtime, Lafayette at rush hour, and the middle of the night in New Orleans. The westbound train leaves New Orleans just after rush hour, arriving in Lafayette at lunchtime and just after the afternoon rush in Houston. It then joins the Texas Eagle just after midnight, and travels overnight through west Texas before arriving in El Paso at lunchtime the following afternoon and dinner time in Tucson and Maricopa. After traveling overnight through Arizona and California, it arrives in Los Angeles before breakfast. Early depiction of the train at Yuma, Arizona. The train crossing Ciénega Creek near Vail, Arizona, in 1921. Before the start of Amtrak on May 1, 1971, the Sunset Limited was operated by the Southern Pacific Railroad. The Sunset Limited is the oldest named train in the United States, operating since November 1894 along the Sunset Route (though originally named the Sunset Express). The Sunset Route (originating in New Orleans) is the southernmost of the three gateways to the West Coast envisioned through the Pacific Railroad Acts. The other two embarked from Chicago and St. Louis. However, the Sunset Route had two major advantages over the other two routes. It was an all-weather, year-round route that didn’t face the crippling snows of the Wasatch or Sierra mountain ranges to reach the Pacific Coast. Additionally, the other two routes had to assault the front range of the Rockies. In addition, opened 20 years before the Panama Canal, the Sunset Route vastly shortened the time to reach the West Coast from the Atlantic Ocean and Caribbean Sea, as New Orleans was already an established seaport for Atlantic shipping lines’ passengers, seeking to reach the US interior. The Sunset Limited allowed passengers to reach the West Coast in a few days, not weeks. The Sunset Limited was Southern Pacific's premier train. Initially, the Sunset Limited was an all-Pullman train, with sleeping cars and no coaches, running from New Orleans to San Francisco via Los Angeles. From its beginning in 1894, until streamlining in 1950, all the train's cars had 6-wheel trucks and dark olive green paint, with black roofs and trucks. In the summer of 1926, it was scheduled at 71 hr 40 min New Orleans to San Francisco; it then carried a coast-to-coast sleeper from Jacksonville to Los Angeles. In 1930, the route was cut back to Los Angeles and the train carried coaches for the first time; it would never be all-sleeper again. In 1936, the train resumed running to San Francisco and was one of SP's first trains to receive air conditioning. In January 1942, it was cut back to Los Angeles, which has remained the western terminus ever since. The train was dieselized in late 1949. In August 1950, it was the last major American luxury train to become a streamliner. Also in 1950, the train got a new look, with stainless steel cars with red letterboards and white "Southern Pacific" lettering. All cars except the RPO-Baggage (which had 6-wheel trucks) had 4-wheel trucks. The last car of the train was a sleeping car with a blunt rear end and a lighted neon sign with the train name on the rear door. Until 1950 the train was pulled by 4-6-2 Pacific type and 4-8-4 GS-1 Northern type steam locomotives between New Orleans and El Paso, and by 4-8-2 MT-4 Mountain type and 4-8-4 GS-4 Northern type steam locomotives between El Paso and Los Angeles/San Francisco. Occasionally, even some 4-10-2 Southern Pacific type and 4-8-8-2 AC class Cab Forward type steam locomotives could be seen, especially on the western portion of its run. Steam occasionally appeared on the Sunset Limited until 1953. After dieselization Alco PA A-A Unit diesel locomotives powered the train between New Orleans and El Paso, and EMD E7 and E9 diesel locomotives in A-B-B sets pulled the train between El Paso and Los Angeles. Between 1950 and 1958 the diesel locomotives were painted in the Southern Pacific's "Daylight" scheme; in the 1960s and 70s EMD F7 diesel locomotives in SP's "Bloody Nose" scheme powered the train on the entire run. Interior of the "Pride of Texas" lounge car. During the decline in the 1960s more and more services on board were cut back, culminating in the elimination of the dining car, lounge car and all sleeping cars. By 1968, the once proud streamliner had three cars: a baggage car, a coach and an automat lunch counter car. The Sunset Limited was even combined with the Golden State passenger train west of El Paso in 1964. In October 1970, the Sunset's daily service between New Orleans and Los Angeles was reduced to tri-weekly, but with full dining and sleeping car service returning over the entire route. This was the state of the train when Amtrak took control in May 1971. Amtrak left the Sunset unchanged, while it dropped the Louisville & Nashville's Gulf Wind, which operated between New Orleans and Jacksonville, Florida. The tracks between these two points remained unused by passenger trains until April 29, 1984, when an Amtrak train called the Gulf Coast Limited, running between New Orleans and Mobile, Alabama, began service, seeking to regenerate some form of regional intercity rail traffic between large cities outside the Northeast. However, this train only lasted until January 6, 1985. Almost five years later, on October 27, 1989, the track segment between Mobile and Flomaton, Alabama, came into passenger train use as part of the route of the Gulf Breeze. This was another attempt to regenerate regional inter-city rail traffic, this time between Birmingham, Alabama, and Mobile. The train was a reestablishment of the Mobile section of Amtrak's New York City—New Orleans Crescent. It branched from the Crescent's route at Birmingham, turning south toward Montgomery, Flomaton, and terminating in Mobile. The Gulf Breeze was discontinued in 1995. Meanwhile, on April 4, 1993, passenger service was reestablished along the entire New Orleans—Jacksonville corridor with the extension of the Sunset Limited to Miami, using the route of Amtrak's Silver Meteor south of Jacksonville. It was serviced at Amtrak's Hialeah yards for the return trip but schedule unreliability caused the Sunset Limited's eastern endpoint to be shortened to Sanford on November 10, 1996. Service was re-extended to Orlando, Florida on October 26, 1997, and the train deadheaded (operated empty) between Orlando and Sanford for servicing. Sanford was, and still is, the servicing point for Amtrak's Auto Train. On September 22, 1993, the three locomotives and six of the eight cars of the eastbound Sunset Limited derailed and fell off a damaged bridge into water near Mobile, Alabama, in Amtrak's worst train wreck, the Big Bayou Canot rail accident. 47 people died. On October 9, 1995, saboteurs derailed the Sunset Limited near Harqua, Arizona by removing 29 spikes from a section of track, and short-circuited the signal system to conceal the sabotage. The attack killed one person and injured dozens of others. The crime still remains unsolved. On June 2, 1996, the Sunset Limited was rerouted to a more southerly route between Tucson, and Yuma, Arizona, bypassing Phoenix. Union Pacific, which had acquired Southern Pacific earlier in the year, wanted to abandon a decaying portion of its Phoenix–Yuma "West Line". This made Phoenix one of the nation's largest cities without direct passenger service; although the designated Phoenix-area stop is in Maricopa, a suburban community about 40 miles (64 km) south of downtown Phoenix. Amtrak Thruway Motorcoach service, run by Stagecoach Express, connects the two cities. The Sunset received a better schedule on May 7, 2012, moving its westbound movements from New Orleans to a Monday, Wednesday, Saturday circuit. The times allow several 7- to 12-hour rides between major-city pairs; for example, overnight between Tucson or Maricopa (for Phoenix) and Los Angeles in both directions. On August 28, 2005, the Sunset Limited route was truncated at San Antonio, Texas, as a result of damage to trackage in the Gulf Coast area caused by Hurricane Katrina. In late October 2005, service was restored between San Antonio and New Orleans, as the line through Louisiana had been repaired. As time has passed, particularly since the January 2006 completion of the rebuilding of damaged tracks east of New Orleans by their owner CSX Transportation Inc., the obstacles to restoration of the Sunset Limited's full route have been more managerial and political than physical. Advocates for the train's restoration have pointed to revenue figures for Amtrak's fiscal year 2004, the last full year of coast-to-coast Sunset Limited service. During that period, the Orlando–New Orleans segment accounted for 41% of the Sunset's revenue. Section 226 of the Rail Safety Improvement Act of 2008, signed into law by President George W. Bush on October 16, 2008, gave Amtrak nine months to provide Congress with a plan for restoring service that "shall include a projected timeline for restoring such service, the costs associated with restoring such service, and any proposals for legislation necessary to support such restoration of service." As of 2018[update], Amtrak's schedules and maps continue to describe the route between New Orleans and Orlando as suspended. Amtrak's Return to Service Special arrives in Chipley, Florida, on February 19, 2016. In 2009, Brian Rosenwald, a now-departed Amtrak executive, outlined ideas for a complete overhaul of the route, including daily service. It was to have the Texas Eagle operate over the Sunset's route west of San Antonio, with a stub train connecting San Antonio (with a cross-platform transfer) and New Orleans. The plans were halted when Union Pacific stated that to get a daily Sunset Limited, Amtrak would need to pay $750 million for infrastructure improvements. Passenger totals would double with daily service, according to the PRIIA study that looked at Texas Eagle/Sunset Limited service. It forecast an incremental improvement of more than 100,000 passengers from the daily service, which is already running in excess of 100,000 a year. In the meantime, the Union Pacific has double-tracked much of the route with its own money. However, Amtrak still lacks the equipment and funds needed to move to daily service. In January 2016, Amtrak and the Southern Rail Commission announced jointly that a Gulf Coast passenger rail inspection trip was to be made from New Orleans to Jacksonville, with elected officials among those on board during the February 18–19 excursion. Stops were planned for all of the stations formerly part of the Sunset Limited's route between those two cities. In June 2018, the commission missed the deadline for submitting a request for service restoration along the Gulf. It said that it could not apply for the Federal Railroad Administration's (FRA) fiscal-year 2017 Consolidated Rail Infrastructure Safety and Improvements (CRISI) funding because Alabama and Mississippi were unwilling to assist with funds. Alabama's share would have been $5.3 million. The Louisiana governor, on the other hand, was willing to provide the funds. The three states' cooperation was needed to secure the $35.5 million in federal CRISI funds. ^ a b "Amtrak FY16 Ridership & Revenue Fact Sheet" (PDF). Amtrak. April 17, 2017. Retrieved February 6, 2018. ^ Hofsummer, Don L. (2009). The Southern Pacific, 1901-1985. Texas A&M University Press. p. 170. ^ "At least one dead, 100-plus injured in Amtrak derailment". CNN. October 9, 1995. Retrieved May 24, 2007. ^ a b "Sunset Limited Schedule; Effective March 11, 2018" (PDF). Amtrak. March 11, 2018. Retrieved October 10, 2018. ^ "Amtrak changes the Sunset Limited schedule: Positives, Negatives, and they agreed to WHAT?". March 15, 2012. Retrieved May 7, 2018. ^ "Release 06-06: NARP Urges Resumption of New Orleans-Florida Rail Service". National Association of Railroad Passengers. May 3, 2006. Retrieved December 29, 2008. ^ "Sunset Limited Marketing Meeting". RailPAC. Retrieved January 26, 2014. ^ "The Sunset Limited and the Future of the Passenger Train". Trains. December 2010. pp. 14–15. ^ "PRIIA Section 210 FY10 Sunset Limited/Texas Eagle Performance Improvement Plan" (PDF). September 2010. 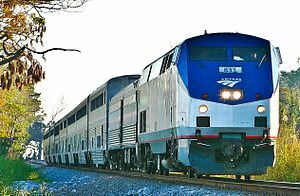 ^ "Amtrak and Southern Rail Commission to Host an Inspection Train Across Gulf Coast" (Press release). January 25, 2016. Retrieved February 13, 2016. ^ "Southern states miss funding deadline to restore Amtrak's Gulf Coast service". Progressive Railroading. June 22, 2018. Retrieved October 10, 2018. Lambert, Anthony (December 21, 2012). "The Ghan: Great Train Journeys". The Daily Telegraph. Retrieved December 24, 2013. This page was last edited on 3 April 2019, at 07:03 (UTC).